*Drawing Everyday*: More Horse Heads And Some Reader Participation! Susan Bronsak writes: "Something I've struggled with through the years is the use of shapes in forming my subjects. 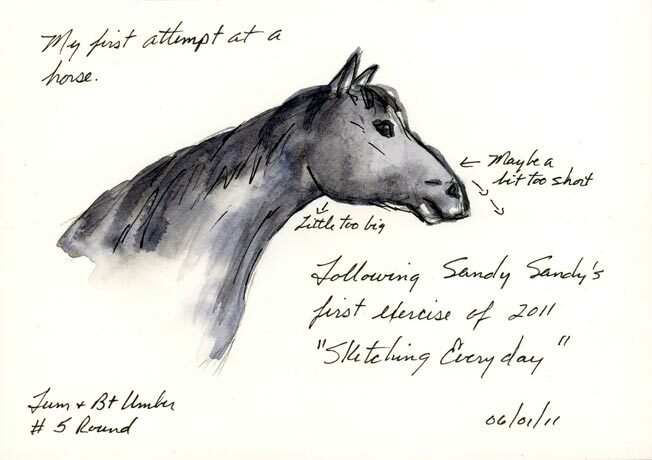 Sandy's first exercise for 2011 is just that, using simple shapes (triangle, circle, and square) to create this horse's head. Although there's room for improvement with my results, I found her exercise easy and definitely fun to follow along." I'm impressed with Susan's drawing and her notes. 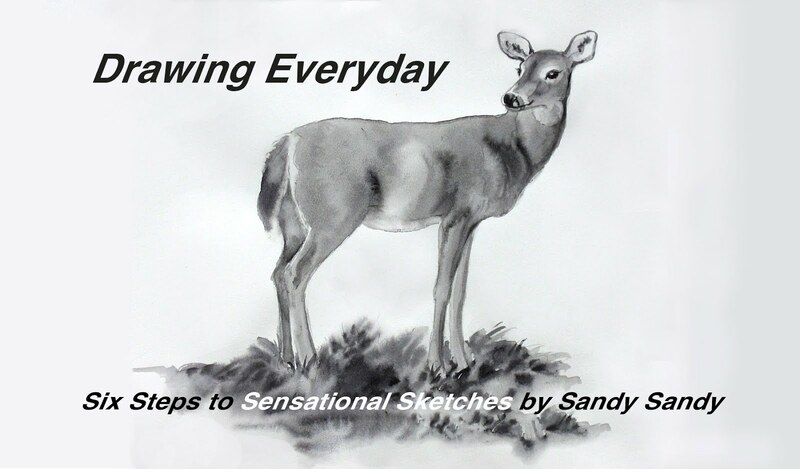 She has reminded me to do more of the same with my own sketching. You think you'll remember these details and things, but you don't. By varying the position and size of the shapes and elements, you will be able to portray different breeds and characteristics. I tried out my theory this morning in the doctor's office. I did these the same way as yesterday, just "head copy"- with no reference. By using this simple formula of circle, square and triangle, it was easy. Both of these were done in less than five minutes while waiting for my check-up in the little exam room. 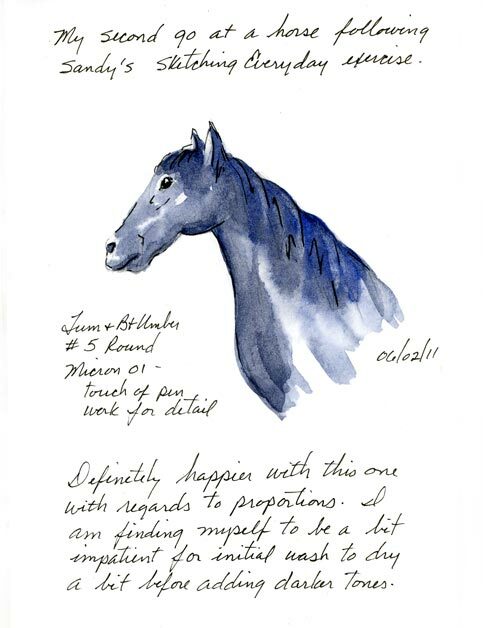 Of course that led to discussion about drawing and talent vs. aptitude and desire with my doc. when she walked in. What fun! Surprise, surprise! When I got home, I found that Susan had posted another horse drawing on her blog! 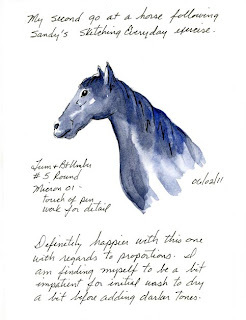 I hope she is not getting tired of drawing horses, because I sure am not getting tired of seeing them!! And again, she's got notes and valuable insights to go along with the sketch! 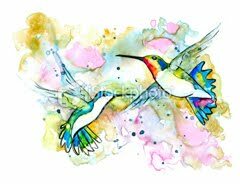 BTW - Susan is also a daily sketcher and has a wonderful blog, sbwatercolors and sketching "Created and maintained as inspiration for others who wish to tap into their creative self and venture into the world of watercolor painting and sketching." Here is a photo of my mare in profile view to copy and use as reference. She is a good example of a Thoroughbred / Warmblood type. 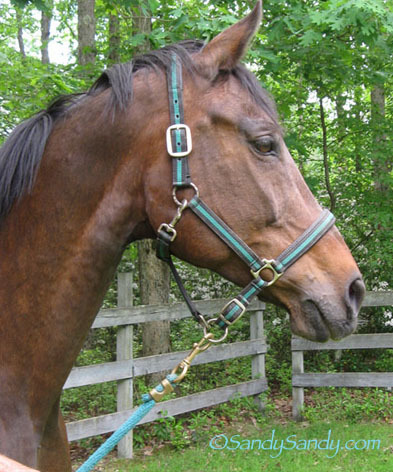 I recommend observing side views of different horse breeds to get a better idea of the many variations. 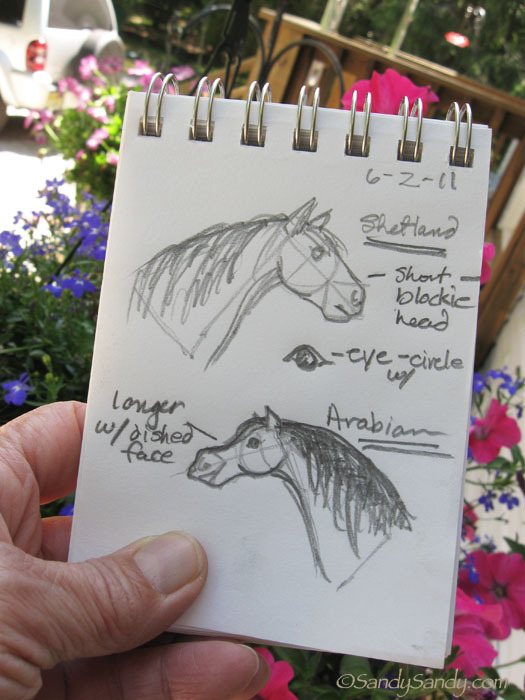 My first sketching challenge is to draw or paint a horse in profile view. You can customize it by depicting a certain breed or individual if you wish. Here's a painting I did yesterday using this (basic shapes) system and Rita's photo for reference..
Because I sell my art and digital mages for a living, photos on my other sites and blogs may not be used without my permission. You may not sign or put a copyright notice of your own on an image if it is a copy of someone else's work and ideally, you should always have permission from the artist or photographer to repost, redraw, paint, or reproduce an image or copy from a work. You can find images that are in the public domain which you may use freely on Wikimedia Commons.